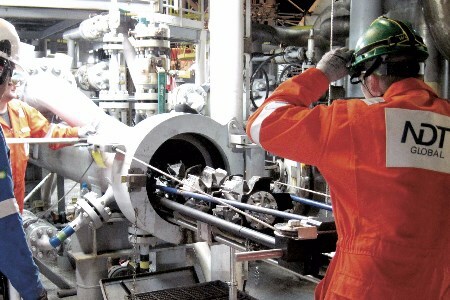 BP required a highly accurate baseline inline inspection (ILI) for a deepwater flowline and riser system offshore southwest Africa. After a detailed review of requirements for this special project, NDT Global engineered a custom ultrasonic UMp tool configuration, which gives a true high definition picture of the pipeline including any corrosion features, pittings or mid-wall flaws such as laminations or inclusions. However, during the pipeline cleaning phase, a huge problem occurred: the gauging pig returned showing a reduced minimum diameter, i.e. smaller than tested and qualified during the onshore testing phase. The challenge was now to engineer a solution to run the ILI tool below its current design limit and at the same time keep risks within acceptable levels. The NDT Global engineering group and the operator's flowlines team conceived a plan in record time to ‘put the pig on a diet’, for a safe passage through the smaller inner diameter of the pipeline. The inspection had to be completed during the planned shutdown window to avoid costly production delays. After 96 hrs of re-modeling, design assurance and risk assessments, the modified ILI tool was launched and returned safely to the FPSO. The new flexible tool achieved a first run success. NDT Global has a long track record of offshore projects and understands the key requirements for success. One of these is enabling excellent open communication between the operator and NDT Global's engineering team when critical issues arise.